The Kangal dog is a large and powerful ancient livestock guardian originally from the Sivas region in Turkey. This dog has been selectively bred over hundreds of years primarily as a Turkish sheep guardian based on their size, strength, temperament and appearance. This guardian is a large and formidable working dog. They are especially suited to working in pairs or team(s) to protect livestock from large predators (e.g. Foxes, Wolves and Bears). Because of this, they have a predictable and reliable temperament of being gentle with livestock and children and aggressive to predators. They were historically bred by Turkish Shepherds, however, in the late 20th century the Kangal become popular in the US for their ability to guard sheep, goats and cattle. He is best suited to an active working role in livestock guardianship on farms or freeholdings. 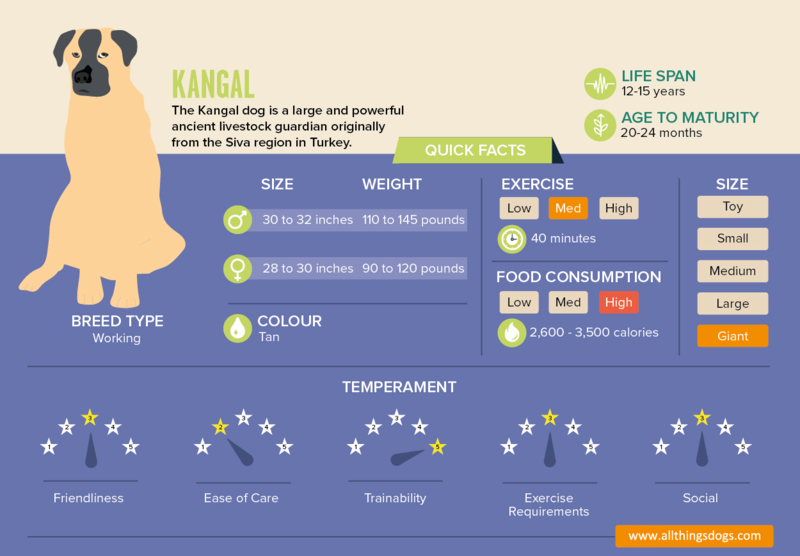 To learn more about kangals, their temperament, behavior, breed standard and to understand if this is the right breed for you, read on. Temperament Peaceful towards known humans, children and family pets. Territorial towards all else. Kangal Dogs have gained a reputation for being exceptionally fierce and loyal in battles, defending their flock, against predators of all sizes. He is a working guard and shepherd dog recognized by the United Kennel Club and the Cynology Federation of Turkey as an official breed. 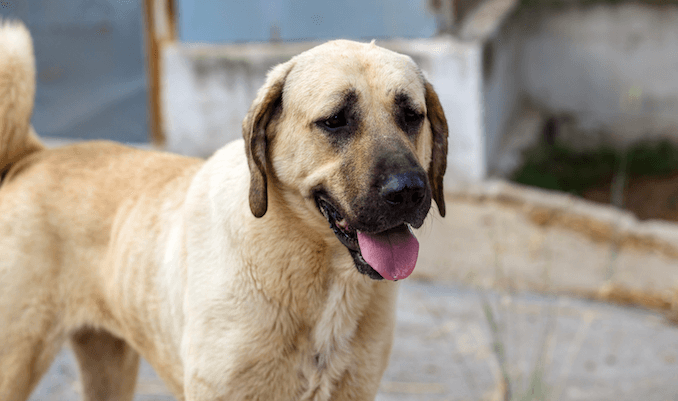 Free Bonus: Download a copy of our free Kangal care guide. This Kurdish dog is the national dog of Turkey. There are two government breeding centers in Sivas; the city where the dog originates from. Turkey is not the only country with this magnificent dog. They gained popularity in the US exactly for the task of sheep, goat and cattle guardianship on large farms. In the US a Kangal puppy will cost upwards of $1,000. Typically, puppies are sold into the US Farming and Agriculture Industry; which also imports the dog from Europe. The Turkish Shepherd Dog originates from the East Anatolian Plateau of Turkey at the beginning of the 12th century. It is thought the Kangal is related to early mastiffs, they have been categorized into the molosser family alongside the American Mastiff and Bullmastiff. The purpose of this Turkish dog is to protect flocks of sheep and in more recent times herds of cattle. He is adaptable to guarding different livestock (i.e. birds), however, they must be trained and managed. They first came to the UK in 1965 and the US in 1985 and around six to ten dogs are imported each year to the US. A Kangal dog is recognized for their predictable and reliable temperament. Turkish Shepherds ensured their dogs did not display aggression towards humans or sheep (i.e. stock or cattle). This behavior would not be accepted, as the shepherds couldn’t afford to lose sheep, consequently isn’t present in the breed. For this reason, despite their size, they are very gentle dogs, calm and peaceful with children and family pets whilst being protective of sheep and cattle. If your dog doesn’t have a herd or flock to guard, don’t be surprised to find them guarding family pets or your children. They will display independence, typically around two years old, which is the age they typically start guardianship. She will be bold and fearlessly loyal to their owner being very trustworthy with known humans or animals. She is always alert and territorial with their family, flock or herd and will find ways to protect them. Because of their origins, they needs a job to prevent boredom and unwanted behaviors. Because she is a working dog, so is not typically recommended for new dog owners or small family homes. You will need a safe, closed area to training your dog, specifically 6-foot fences with deep foundations; to prevent digging and jumping. Like other livestock guardian dogs, they bark an awful lot. Your dog should never be expected to welcome unwanted strangers or predators into your property. A Kangal dog has incredible instinct and ability to sense a predator. Typically, two or three dogs are able to protect a flock of anywhere from 150 to 250 sheep. The best combination is two neuter males and a single female. This enables active patrolling and guardianship. He has speed, power and agility reaching a speed of over 30 miles per hour (50 kilometers per hour) and a bite force of over 700 psi; three times that of a Pitbull. Placing themselves between the flock and predator he will attack by throwing their shoulder to knock down a predator before attacking hind legs and throats. He can successfully guard against raccoons, coyotes, hawks, foxes, wolves and bears. This is not the easiest of breeds to handle; people have historically used this breed for the wrong purpose. They have wonderful and intelligent personalities in a working scenario. She is most definitely a working guard dog. A Kangal dog will reach maturity after two years. A puppy will mature slowly, compared to other guard dogs, and can be very cumbersome; they are notoriously powerful chewers and diggers; they especially like digging under fences! These dogs grow up slowly, even compared to other livestock guard dog breeds. They can be goofy and adorable as puppies but they are also famous as powerful chewers and diggers. Historically these Sivas Kangals would eat scraps from villages; including water, goat’s milk, yoghurt and bred. This was known colloquially as yal. This guardians historical diet probably isn’t nutritionally complete, as it lacks protein in high amounts, so you should look towards a high-quality kibble; feel free to add raw meat occasionally. However, this breed does eat less than you would imagine for such a giant breed. In the US there is not a legal requirement for quality control on dog food or to meet AAFCO nutritional guidelines or packaging. For simplicity and ease of care the majority of these dogs are fed with a high quality kibble; especially formulated for large-breed and active dogs. However, some ranches opt to feed a raw diet. The dog will thrive on both diet types, however, in cities or suburban areas it’s best to avoid a raw diet with this dog due to the logistical requirements of preparing, buying and freezing the feed. A fully grown male will typically consume 7 cups (2 quarts) of dry kibble to reach their calorie intake. Make sure these calories are balanced between protein, fats and carbohydrates. A dog typically requires 30 calories per 1lb of body weight. This is heavily influenced by how active the dog is and their age. 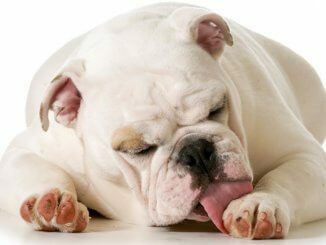 Overfeeding a puppy will not increase their natural size and will result in obesity. With larger breeds, it is far better to give your puppy enough food for a ten-minute serving. If your puppy has left over food after ten minutes then calculate the leftover and reduce their next serving accordingly. During their juvenile phase they require something to chew; leather straps or toys are a great substitute to a bone. They will roam for 10 miles per week; 45 minutes per day. Being an active guardian dog; they certainly require the opportunity to exercise and are an active dog. These dogs are not overly active (e.g. Huskey), however, they are best suited to large working farms with outdoor space. He requires a private and calm place to exercise, ideally fields of more than five acres where they can roam. Whilst patrolling a property he naturally finds higher ground to act as a viewing point. Whilst out in public, your dog should not be trusted off-leash. He should only ever be off-leash in privately owned properties with secure perimeters. Your dog will rarely require deliberate exercise, self-exercise through guardianship is all that he will require. In addition to physical exercise, he is a very intelligent dog who requires mental stimulation. Obedience and agility training should be avoided. It is practically impossible for any livestock guardian dog to undergo basic dog obedience. Allowing your Turkish dog plenty of time to patrol, roam and run will help them to develop into a loyal and trusted dog. Before you attempt to train a Shepherds Dog, you must acknowledge their different characteristics from other breeds. 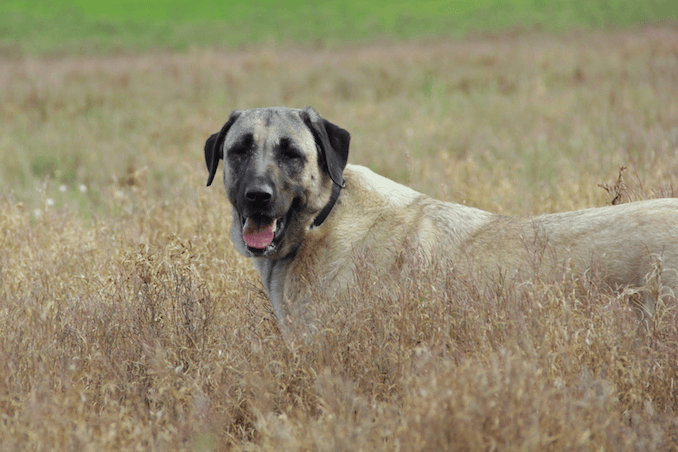 This Kangal Shepherd Dog has been bred for hundreds of years as a guardian and has incredible devotion to their flock. 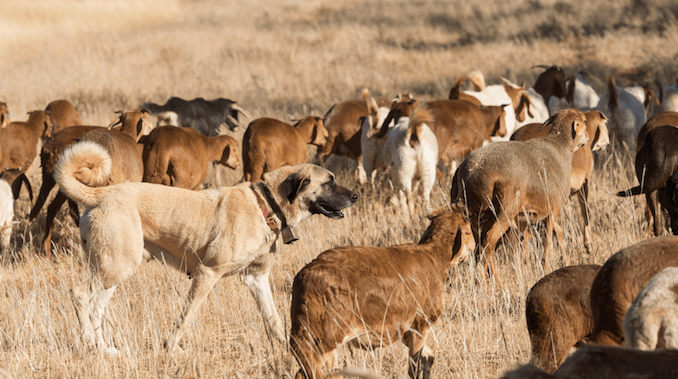 Owning a livestock guardian dog is not like owning typical dog breeds. They are incredibly intelligent and independent thinkers. Their ability to aggressively defend their herd is innate to them and they require no training for this task. 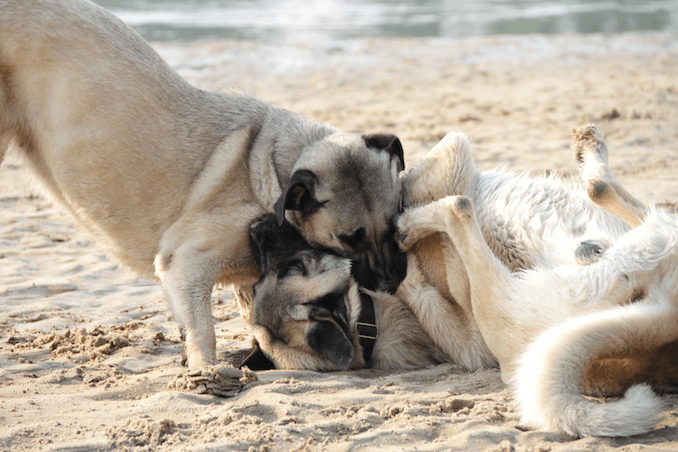 Your training role with a Kangal will mostly be supervision, as conventional dog training is almost impossible with this breed. Some sources online, quote tis dog as being a superb dog for personal protection – this is completely unadvisable. Much of this dogs socializing comes through guardianship in couples or sets. Companionship is given to a Kangal from a very young age by their pack, mother and master. Most importantly, this dogs requires active and young socialization; especially if they are being used in protection to become exposed to other sounds, smells and animals. Exposing your dog to their property at an early age helps to prepare them for their active role. She requires minimal grooming with their short dense double coat. She sheds their coat twice a year with spring and winter. During the start of each season, she will require heavy brushing using a metal comb and deshedding tool. The tool quickly removes loose hair from their undercoat which can be trapped by their overcoat. His dense coat will shed consistently throughout the year so is not a hyperallergic dog. 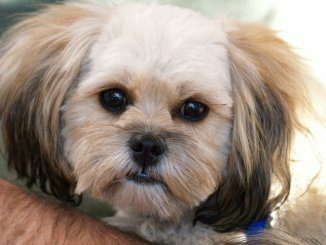 Unlike smaller breeds, this dog does not require their teeth brushing, dental hygiene can be maintained by their diet and bi-annual visits to the veterinarians. This isolation has resulted in a large and formidable flock guardian whose size has developed naturally over centuries of active flock management. They are a very pure breed with little cross-breeding in their history; due to Sivas being so remote from other cities in Turkey. This isolation developed an easy-to-identify breed standard due to its lack of cross breeding; non-standard colors (e.g. brindle or white on the body) or coats (e.g. fluffy) are indicators that the dog is not a purebred. This purebred dog is a powerful dog which should be between 30 to 32 inches to the withers (i.e. top of shoulder blades) and weigh between 110 to 145 pounds. A Turkish dog will be slightly longer than they are tall with a curled tail to complete the famous silhouette. The Sivas dog’s color is a famous characteristic of the breed; it should ALWAYS be a solid tan (i.e. light golden, fawn sable, or dun). It is said Turkish Shepherds wanted their dogs to be tan so they are easier to see at night and differentiate from predators. His face should have a black mask covering their muzzle in its entirety with soft glossy black ears. They must always be tan in color with a black muzzle and ears; no exceptions. Occasionally they will have white markings on their toes or chest; this should be a solid coloration and not spotted. Some crossbreeds have brindle or white colorings; brindle is a sure sign of crossbreeding and white is only allowed below the knees of the dog (i.e. feet only). The coat of a Kangal is a double coat. This should be a short and quite dense double coat. The topcoat should be tan (as discussed above) and will be harsh to the touch, whilst the undercoat should be gray and soft. The length of coat is between 3cm and 7cm depending upon the season. Her coat will change with the season, during the winter the coat will become thicker making the coat very dense. In the Spring the thicker coat will be shed as her coat returns to a normal state. The coat is straight, it should never be long, wavy, wiry or fluffy. She does not have dewlap (i.e. skin rolls). Head The skull is rounded on all sides with light furrowing in the forehead (without dewlaps). The head should be large and the head width should be 55% of the head length. Neck The neck should appear muscular with the skin attached tightly to the neck base with none or very minimal dewlap. Body The body should be between 10-12% longer than the height of its withers, a typical male body should be 33” to 36” in length. Tail The tail is level with the coup line starting with a thick base and tapers to a curl at the tip. Feet Large rounded or oval feet with larger front feet and either a solid tan or white. Coat A short straight dense double coat 3cm in the summer and 7cm in the winter. Color Solid tan color on the dog with a full black muzzle mask and black ears. These Turkish Shepherds dogs are renowned for their incredible health. The only reason they are not entirely free from known health conditions is because of hip dysplasia; due to their size. Canine Hip Dysplasia is a heritable condition in these dogs which causes large amounts of pain and arthritis in the dog’s hip joints. This occurs in 50% of large dog breeds and surgery to improve the condition can cost in excess of $6,000. Hip dysplasia is the only genetic disease known to affect the dog. Like with most giant breeds, medical care is required in far larger quantities (e.g. heartworm preventatives) and consequently costs more. The estimated cost of medical bills for the first year is $1,200. 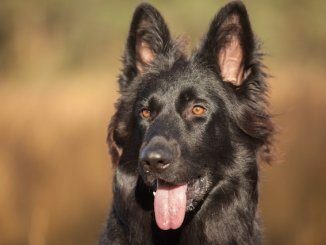 This breed is a very health breed, and providing you buy from a good breeder – which has bred the dogs responsibly, then they shouldn’t have many health conditions to be concerned of. There are four known and recognized breeders in the US. The breed dates back to the 12th century, where Turkish Shepherds would use the dog to guard their sheep from predators including wolves and bears. A fully grown male can be over 140 lbs. The Turkish dog has the strongest bite force in the canine world being able to generate a force of over 700 pounds per square inch; compared to a Rottweiler of 328 pounds per square inch, or a human with a biteforce of 150. This dog is not a Anatolian Shepherd, they are separate breeds descending from an ancient legacy. Two or three are perfectly able to protect a flock of sheep between 150 and 250. A successful owner must be loving whilst providing the dog with an active role and firm leadership. Consistent applied training and socializing will allow this magnificent guardian to become well trained in flock managed, security or companionship. This breed has lots to offer; loyalty, fearlessness and guardianship. 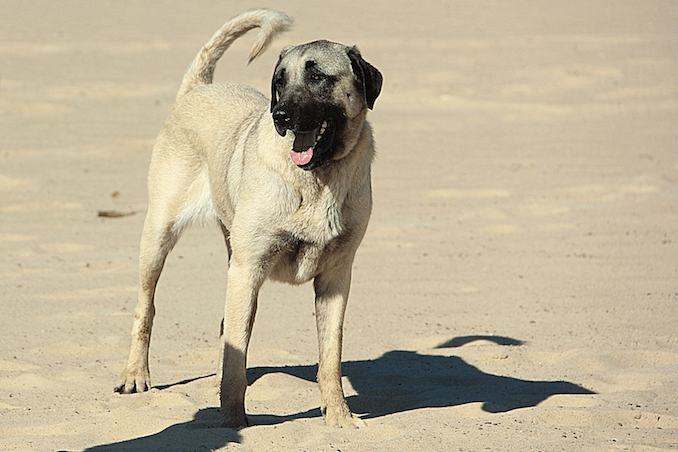 Have you owned a Kangal and what role did they have? Feel free to share your experiences or ask questions below. The only “role” my little girl (117 lb.) has played is to be my bundle of pure love, dedication and protection. She is a 100% pure Kangal, with a registered sire (imported from Turkey) and a dame that traces her lineage back 5 generations. If I had previously known about this breed before, I would have had owned a Kangal long before; fantastic companions and family members!!! When I lived in Tabriz, Iran we had a Kangal as one of our guard dogs (the other two were Caucasian Sheepdogs). Aslan, our Kangal was intelligent, loyal, and fiercely protective. I would definitely consider welcoming another into my life as a guardian for my farm. I have 10 acres. This dog came to us as a stray pup. Took a little coaxing for him to trust us, but once he did he was totally ours. Gentle & kind – this breed is superb! !